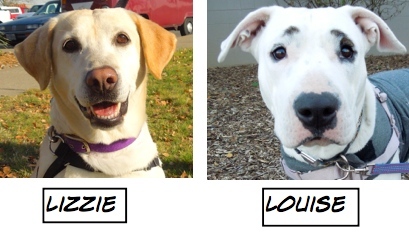 It’s been a wonderfully busy week at Willamette Humane Society with lots of adoptions despite the sudden arrival of winter and snow! 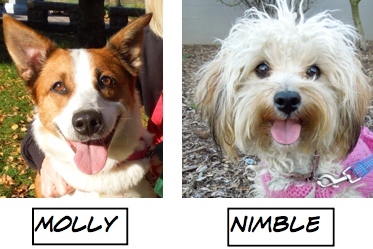 Here are the Blog Dogs who have gotten adopted over the last seven days. 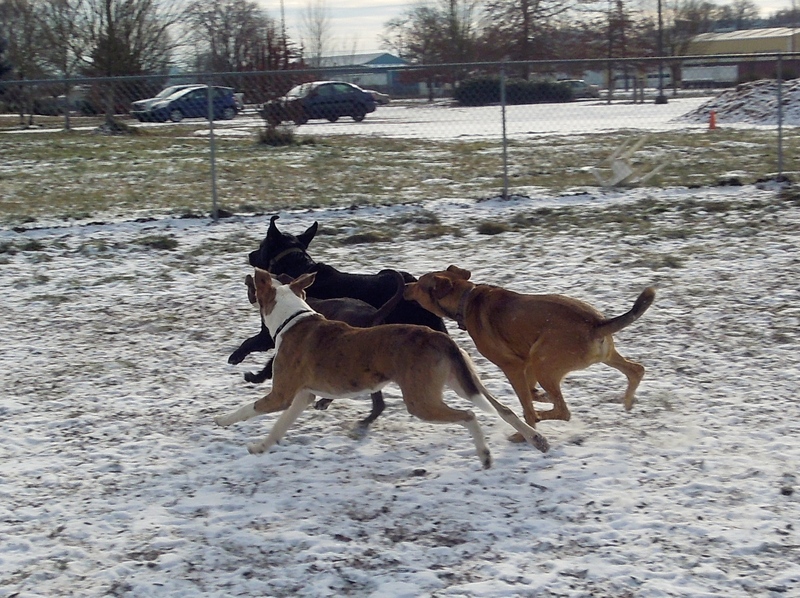 Play group was snowy and too cold for our little guys, but the rowdy kids had a blast. 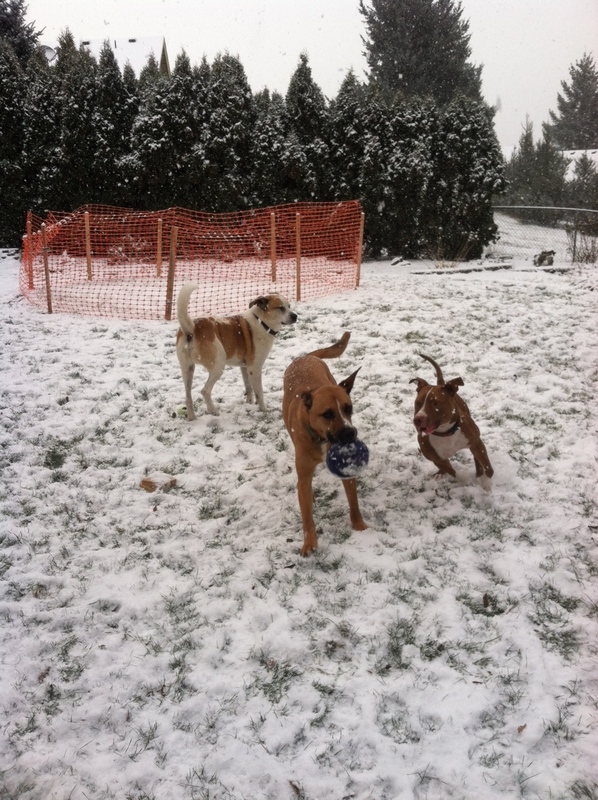 For some of our California transplanted dogs, it was their first experience with the white stuff. 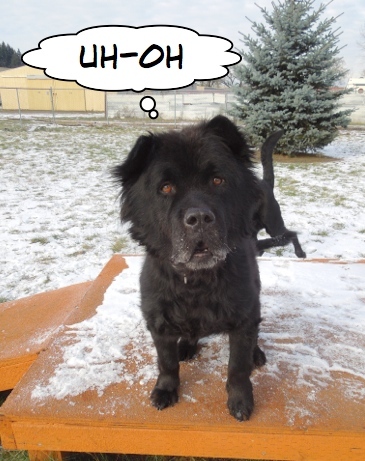 Oso was especially taken aback by his first encounter, as you’ll see. 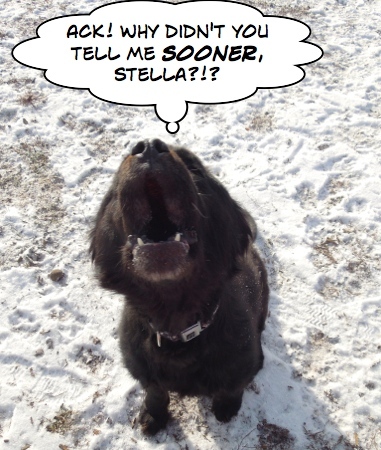 Stella had some passing advice for Oso about snow. 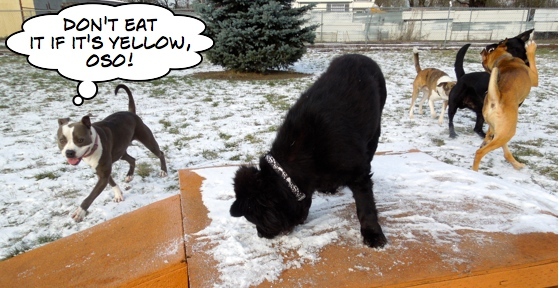 Stella really wanted to try some snow art. When that didn’t work, she tried something else. 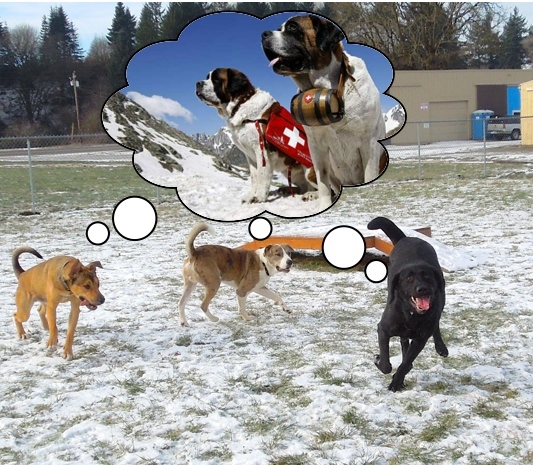 The dogs got a little carried away with day dreams. And sometimes there was no talk, only fun running in the snow. Sunday afternoon was new-dog picture taking time. I’m a little older, but am looking for a great new home! 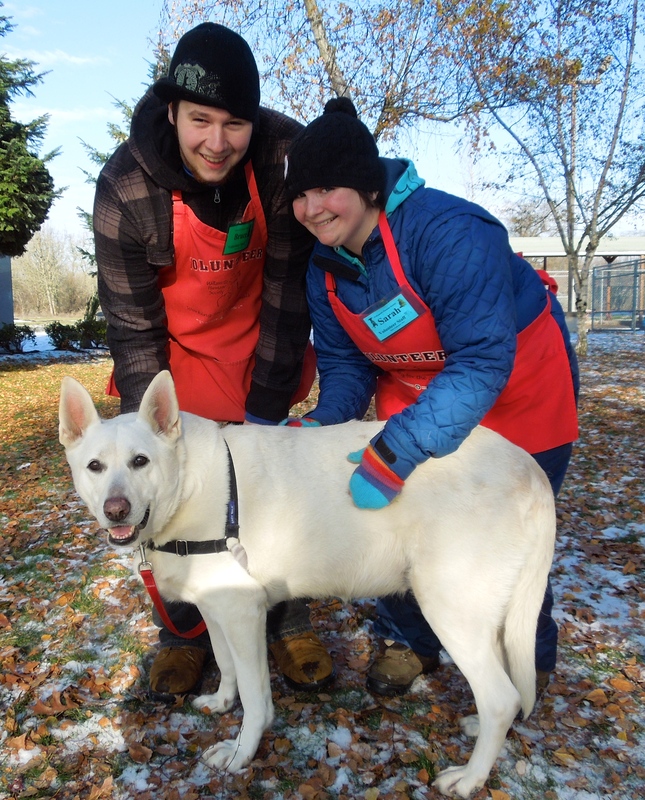 Bruce and Sarah took a strong liking to Snow, a seven-year-old German Shepherd. She has been an outdoor dog her entire life, and would love to spend some time inside, but will need some help learning the rules (i.e. house-training). She also would enjoy long walks to lose some of those pesky pounds that creep on as we get older. 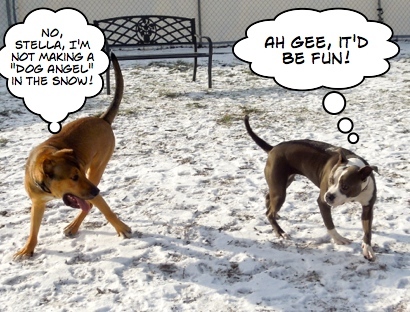 Snow was not a huge fan of play group on Sunday. She enjoyed being with the humans more than the romping dogs. 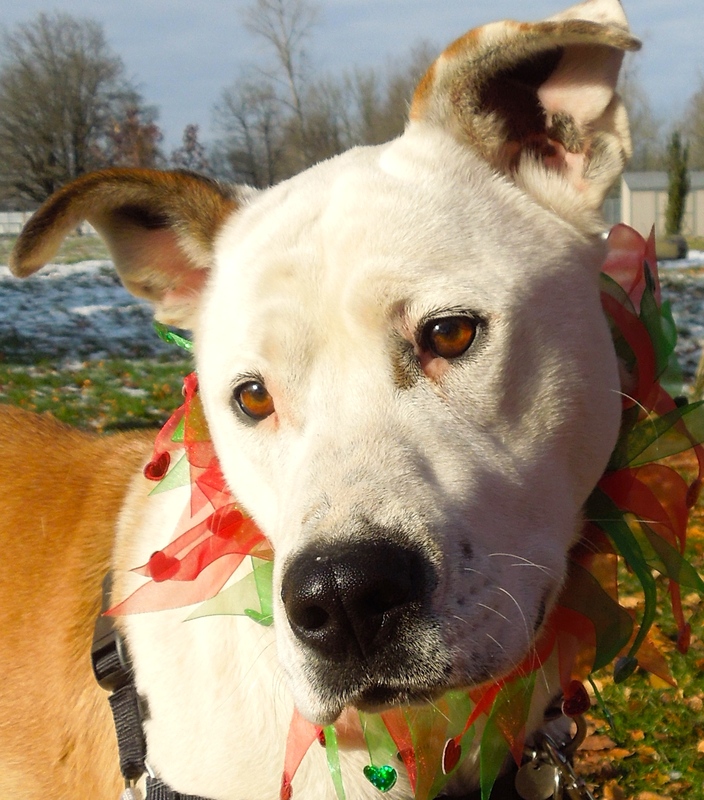 Snow is a sweetheart and is hoping for a relaxed, quiet home where she can be someone’s best friend. 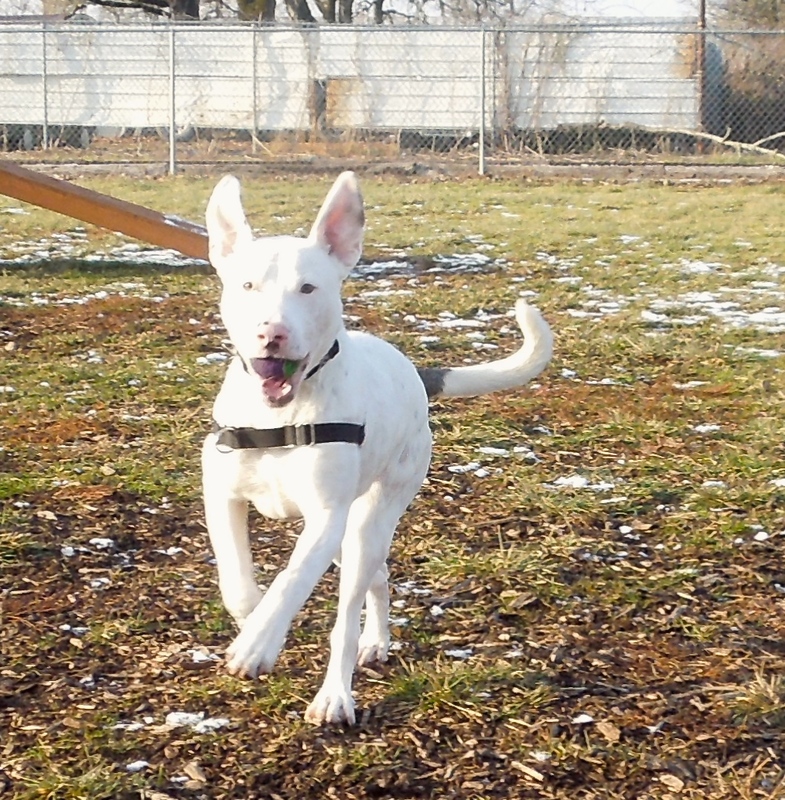 Looking for a playful, energetic, glass-is-half-full kind of dog? Is there anything cuter than a play bow? 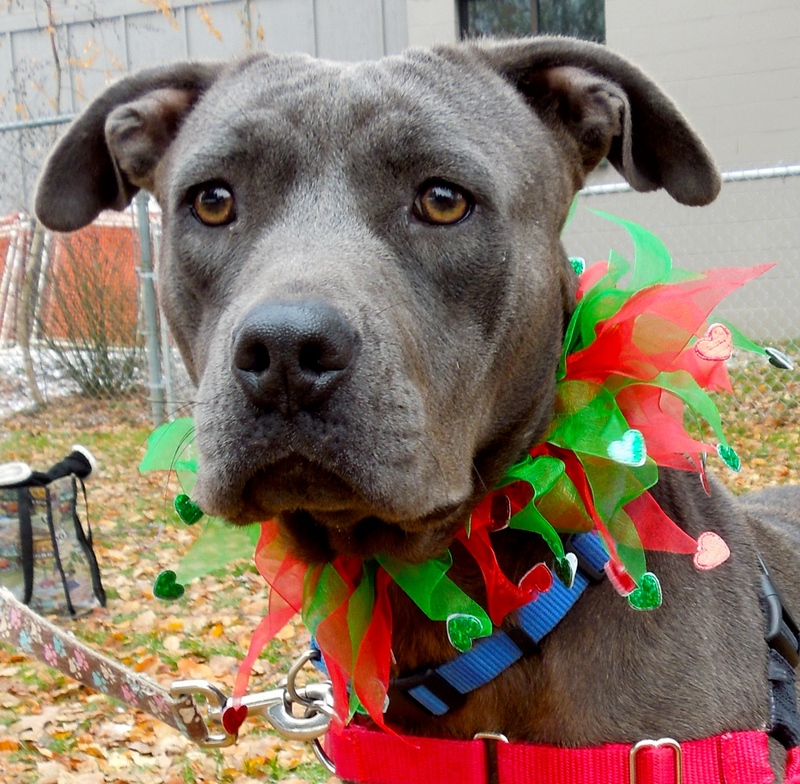 Meet Sunny, a two-year-old Labrador Retriever/Pit Bull Terrier mix. She has a bit of a cold at the moment, but that isn’t stopping her from her love of chasing tennis balls. This picture was taken last Thursday by volunteer Marla when she took Sunny out for her morning romp. 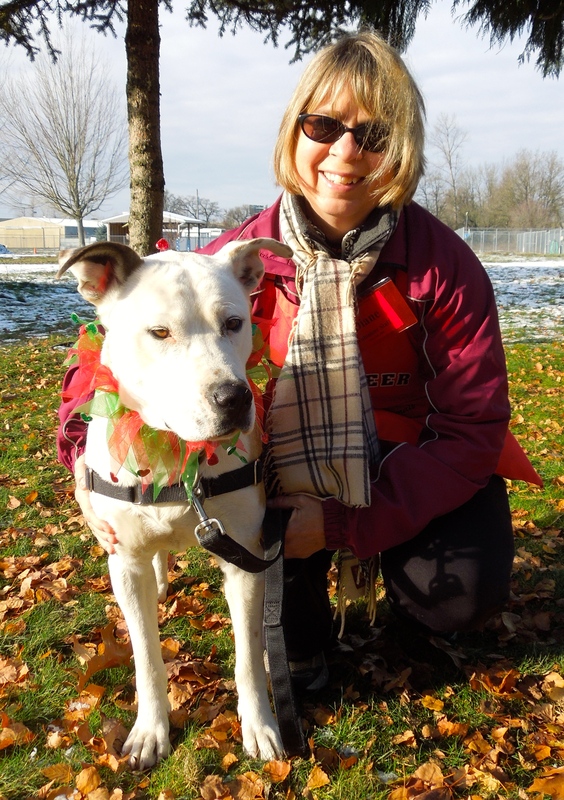 Sunny’s adoption package includes a class called “Check-in and Chill-out” which will be perfect for this active girl who will benefit from some additional training. 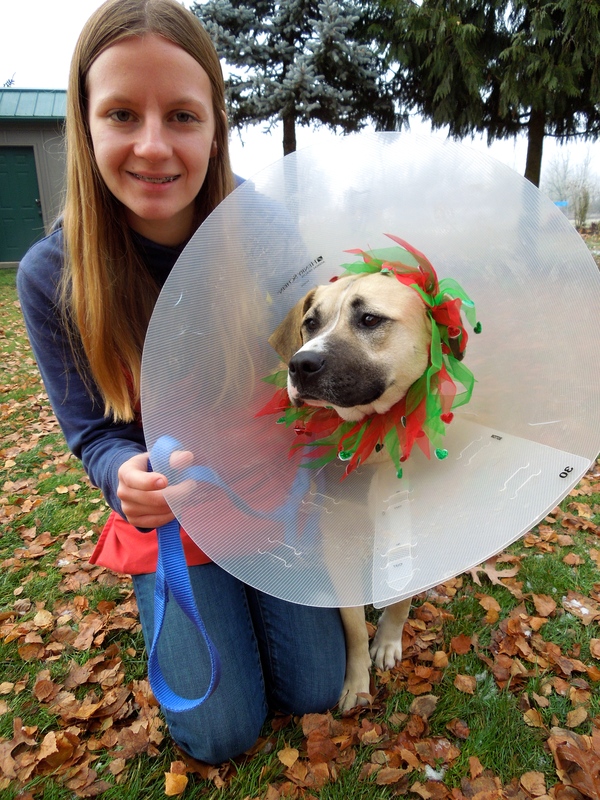 Sunny has been at the shelter since November 15 and is hoping for a home soon. I’m wishing the right family fit will come soon for this eager gal. I’m still a puppy! Aren’t I just adorable? Carol thinks so! The first walker I saw today was Carol, with little Chrissy. 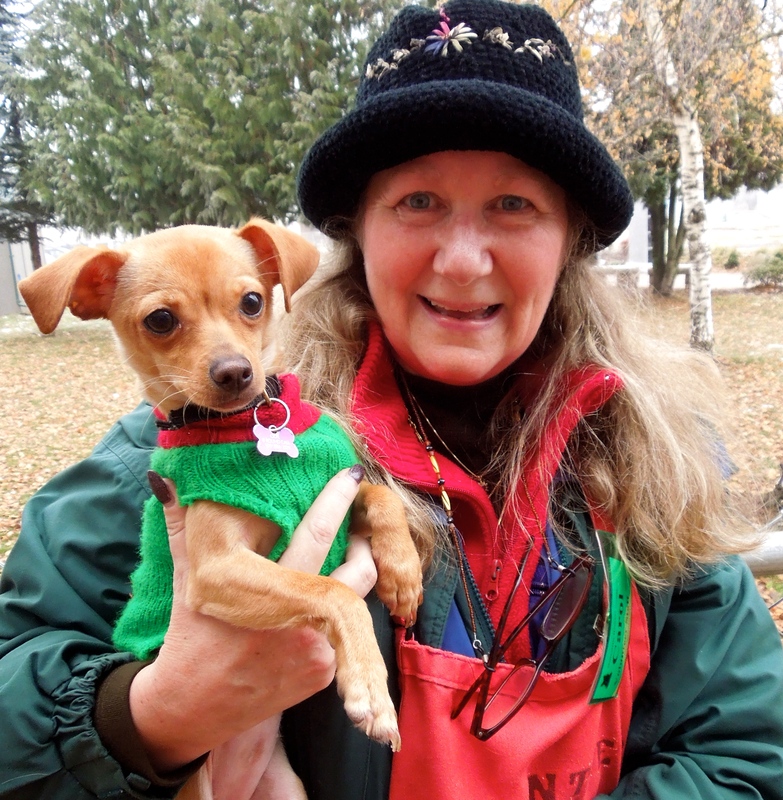 Chrissy is a five-month-old Chihuahua mix who is looking for a patient family who will help her to gain more confidence. She is quite shy and takes a little time to warm up. To help her family learn how to work with her, Chrissy’s adoption package includes puppy classes. 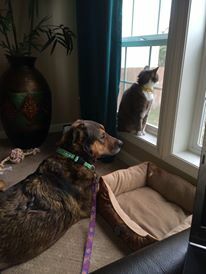 She is good with both cats and dogs. It would be best for her to go home with older children or adults. She is such a cutie and with an understanding family, will grow into a terrific little dog. We’re new here. We flew in from California. We want to be Oregon dogs! 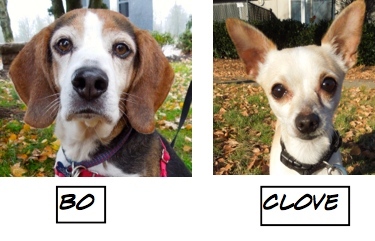 Last week two new dogs arrived from an overcrowded shelter in California on a Wings of Rescue flight. 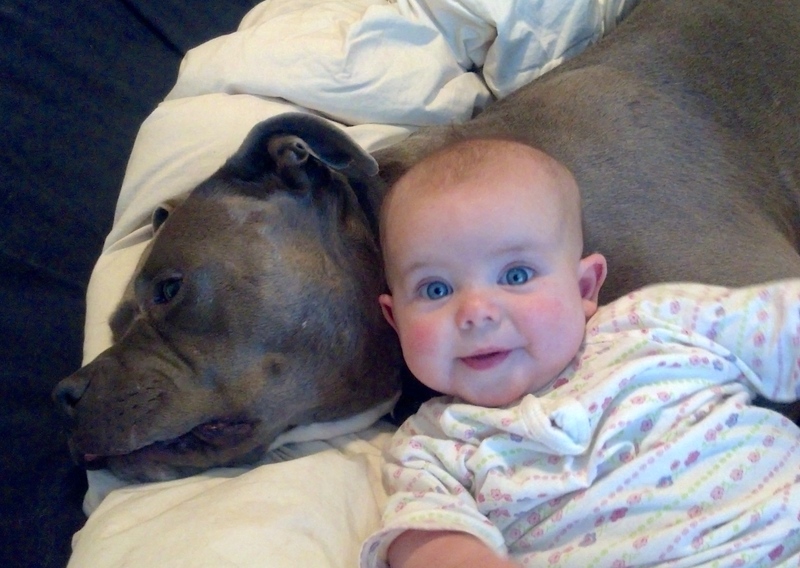 First, this is sweet Leigha, a nine-month-old Pit Bull Terrier mix. Yes, she has a worried look on her face. She stands quietly in her kennel, unsure of this new place called Oregon. Kathy took her out this afternoon and Leigha walked well on leash. She knows how to sit for hot dog bits and photos. She was gentle and calm, but seemed interested in other dogs and wanted to play. She is a beauty! 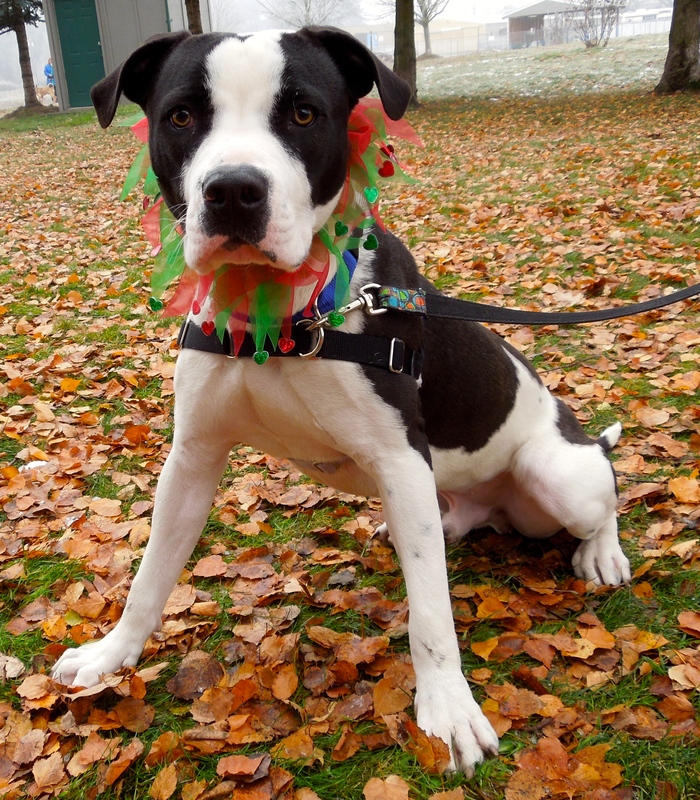 Perseus is a one-year-old very handsome Pit Bull Terrier mix, also just arrived via Wings of Rescue. Perseus is a big boy, but walked beautifully on leash, was gentle in taking my hot dog bits, and knows how to sit on command. He is such a great dog! Here he is with Debbie today. 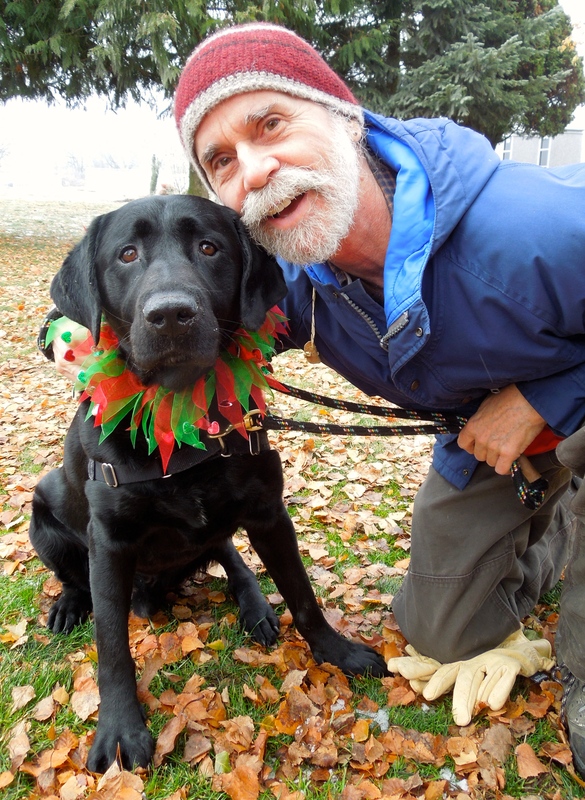 He wasn’t sure why I was putting a red and green fancy thing around his neck, but accepted it without complaint and tried very hard to pose nicely for my camera. 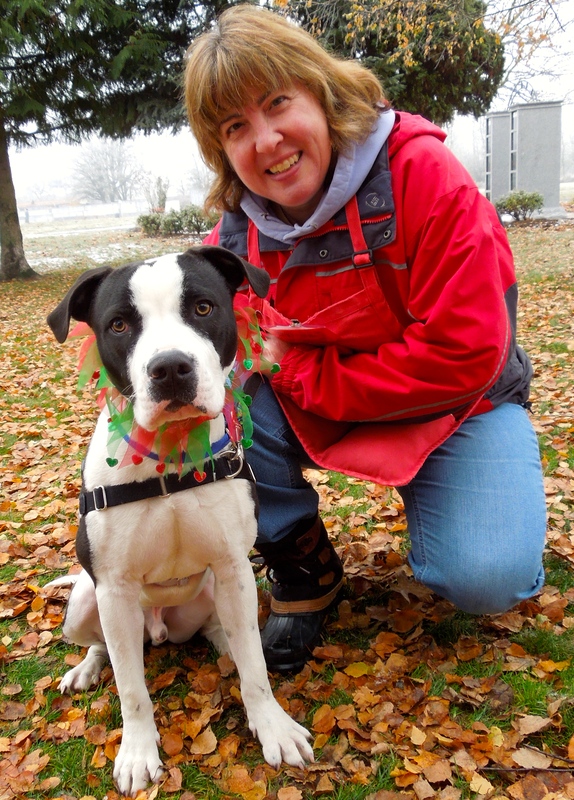 Are you an experienced big-dog person up for a fun and rewarding challenge? 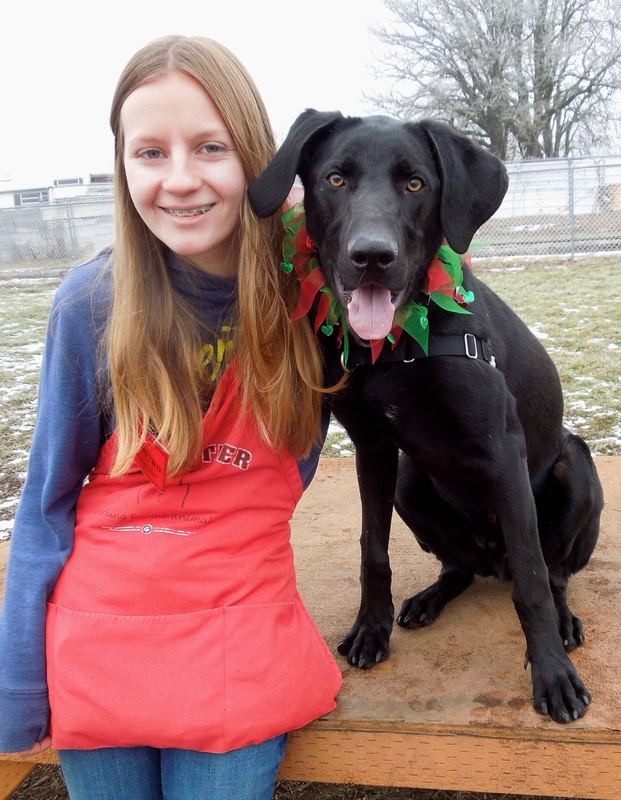 This is Shadow, an 82-pound Weimaraner mix who is one big puppy! Look at that great face! 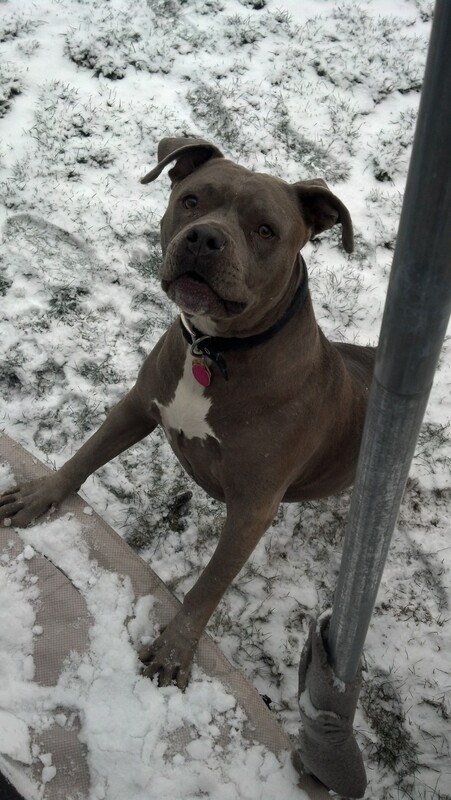 Emelynn took this big boy out to the yard today and let him have a blast running and playing in the snow. He LOVES snow! 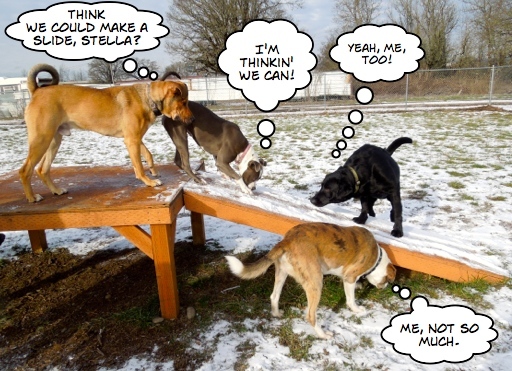 He also had a grand time in Sunday’s play group romping with Stella and Kratos. Shadow knows some basic commands and wants badly to do the right thing, but needs someone to show him the rules in a positive way. With kindness, fun, and patience, Shadow will become a wonderful new best friend. Here he is listening intently to Emelynn as she explains to him that people don’t like it when he jumps up on them, but love it when he sits. WHAT? It’s almost Christmas and I’m not adopted yet?! 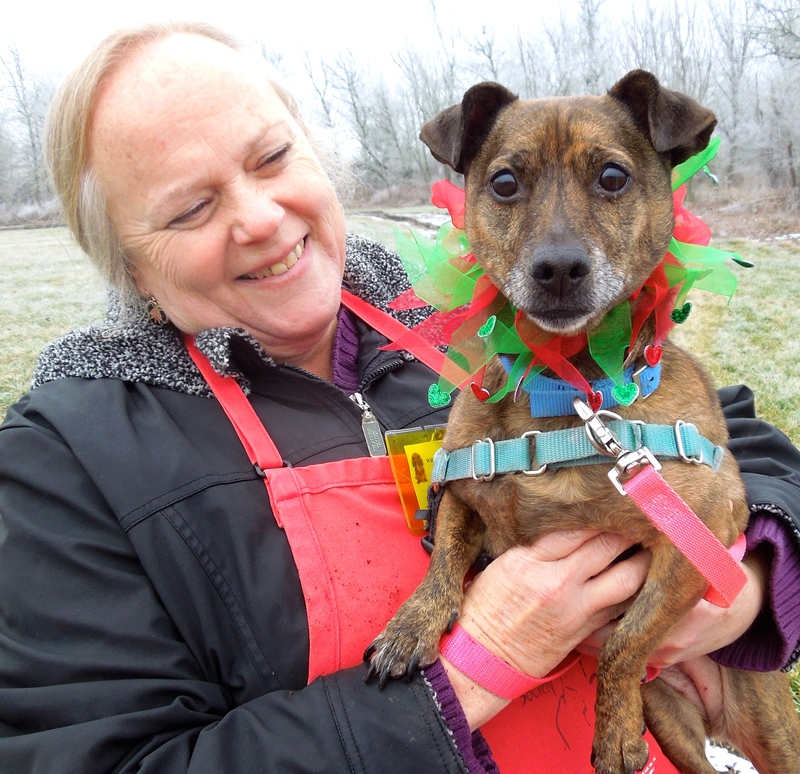 Cameron, a Miniature Dachshund/Jack Russell Terrier mix, is eight years old. 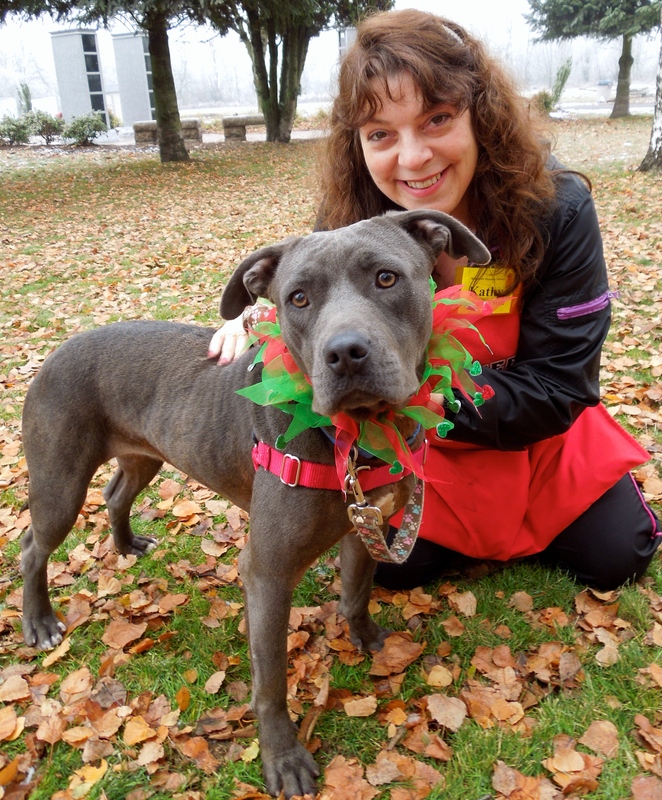 She has been at the shelter since the 19th of October and is still waiting for her forever family. 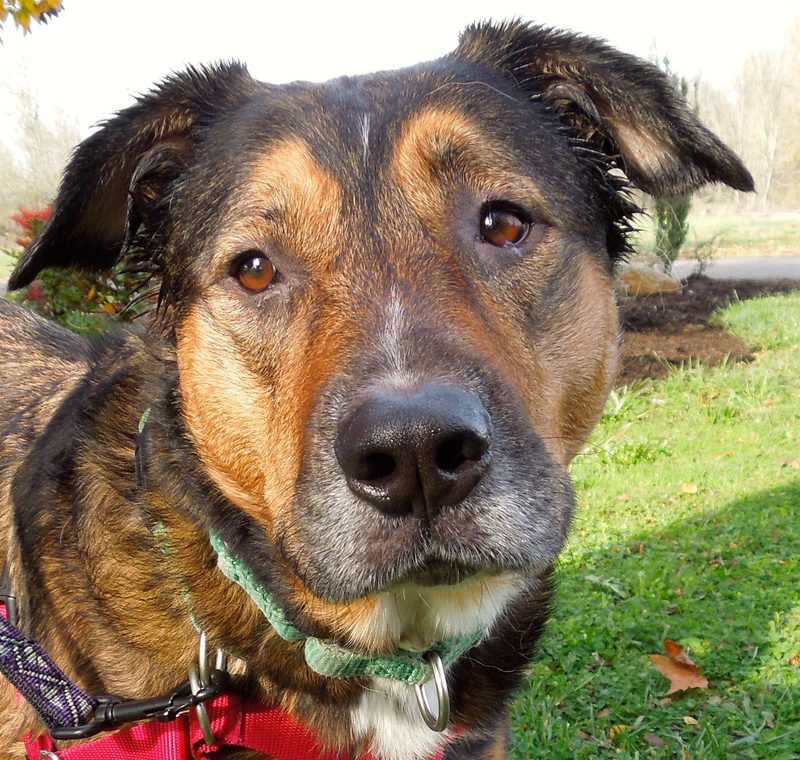 Cameron is a sweet, gentle, laid-back girl who loves walks and just hanging out with her people. She is trying to lose a little excess weight and thinks that taking walks with a best friend is the answer. This little dog will make a perfect family addition. I hope she is adopted very soon! Joan and I both love her and want her to stop having to worry. I’m Bo. This is my friend, Steve. 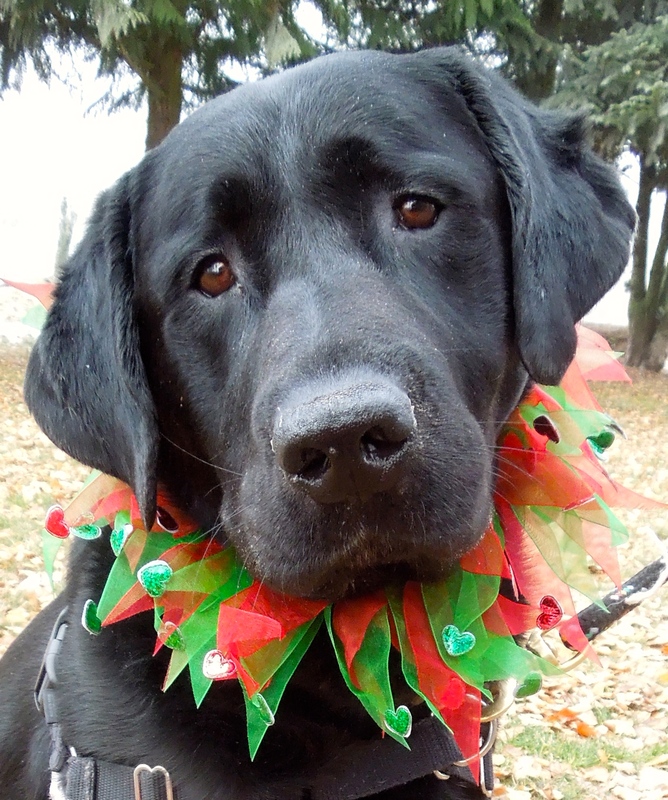 Meet Bo, a two-year-old Labrador Retriever mix. Bo was not feeling up to his usual self today, having just been neutered. But I’m sure he’ll be back up and running very soon. In the meantime, Steve spent some quality time with this big boy. Bo has a hold on him, so I’m hoping he’ll be going home very soon! I’m back! Will YOU be my forever family? Bon Jovi was featured in an earlier post, was adopted, but it wasn’t the right fit and so he is back. But he’s had a hair cut! He look sooo much cuter now! 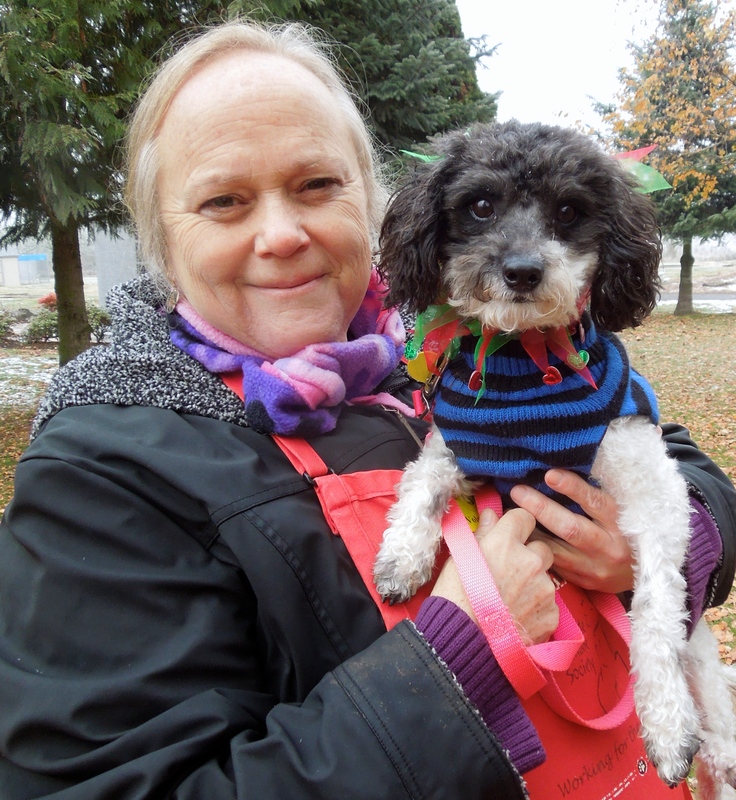 Bon Jovi is a one-year-old Miniature Poodle mix with lots of energy. Today Joan took him out for his walk. He’s looking for an active, fun family. He’d be a perfect candidate for our WHS training classes so his new people will know how to handle his youthful high energy level. I wasn’t a bit surprised when Emelynn chose Azalea as her pick this week. This very shy girl has been an outdoor dog, but is really looking forward to being an indoor dog. She is a one-year-old Boxer/Pit Bull Terrier mix. When I first met her on Sunday morning, she was too nervous to leave her kennel. 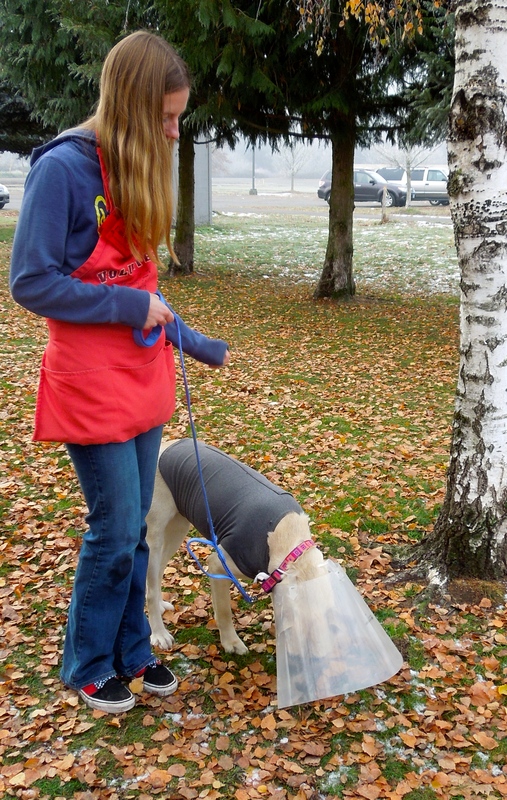 But today, although she had a cone after being spayed, she was willing to venture out into the cold. 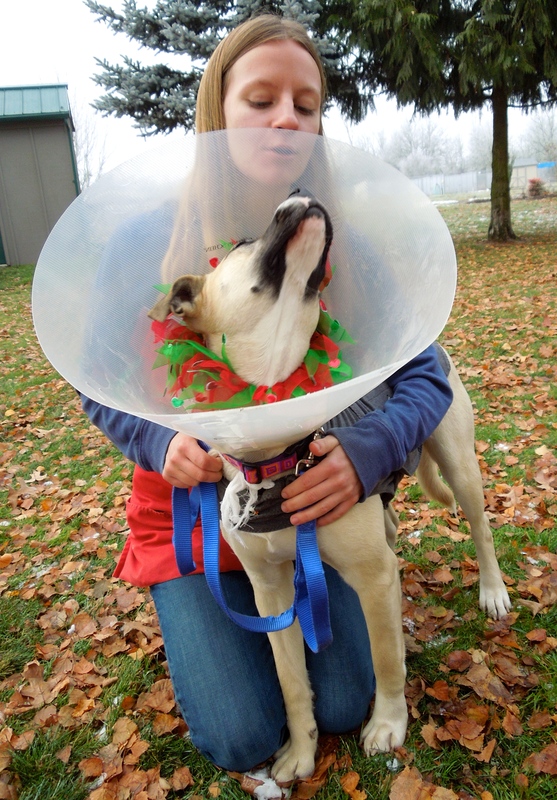 She even let me put a Christmas collar on the inside of her cone! She will need a patient family to help her gain the confidence she needs. 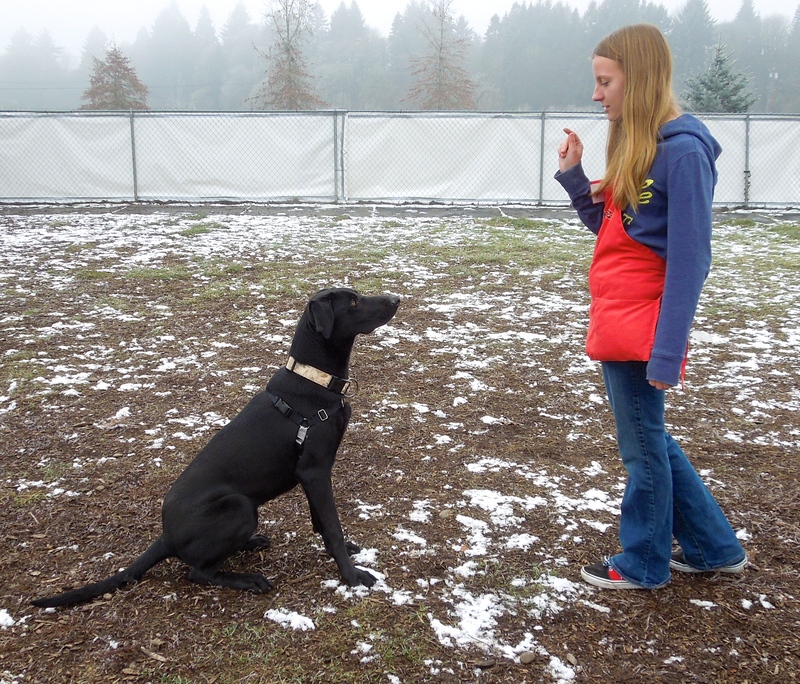 To help with that, a training class is included in Azalea’s adoption package. She quickly warmed up to Emelynn and I love these pictures of them. I’m Mixy and I’m looking for a new family, too! 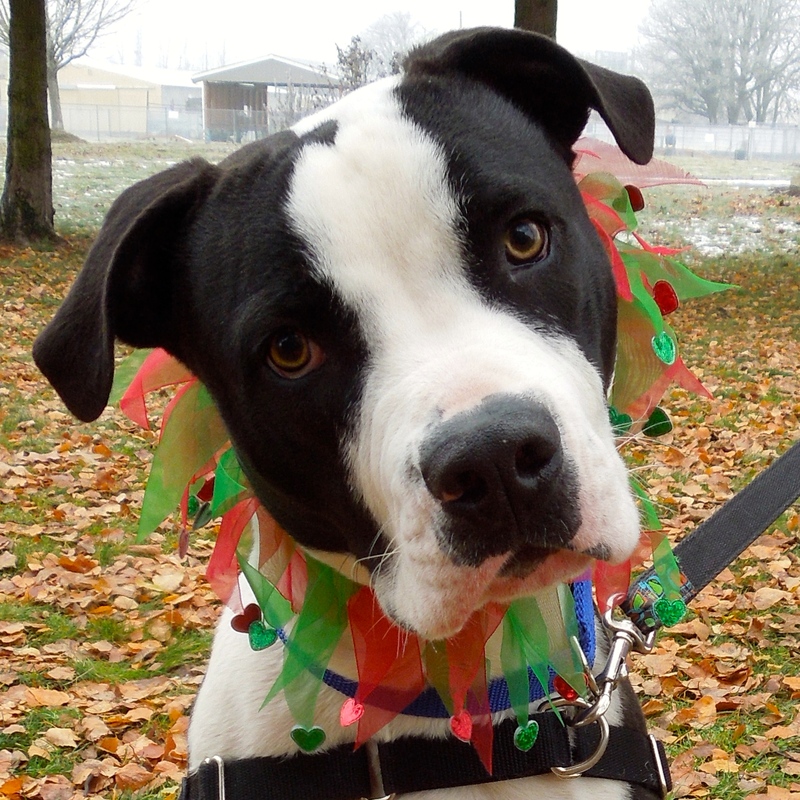 Mixy is Azalea’s sister, and is also a one-year-old Boxer/Pit Bull Terrier mix. She is not as shy as her sister, however, and willingly came outside with Diane on Sunday. She, too, would like to be an indoor dog, and may need some help with house-training. She is a very gentle soul. She walked well on leash and took my hot dog bits politely. She’ll make a wonderful family dog. Dallas here! I love to play! Do you want to play? Emelynn’s and my last dog today was Dallas, a Dalmatian/Australian Shepherd mix who is about one year old. 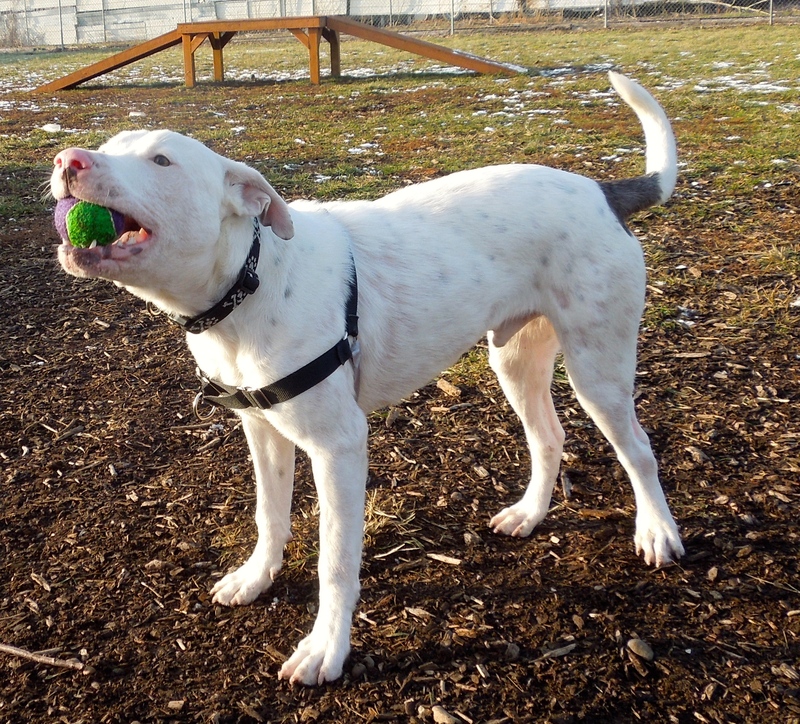 Dallas does not have good kennel presentation, as he is so eager for you to take him out to play. 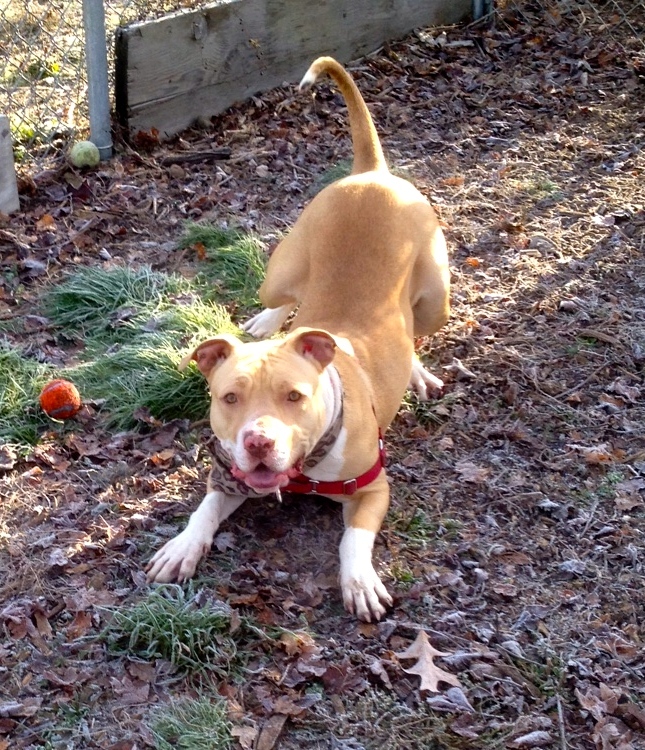 However, once outside, he walks very well on leash, and we had a great time playing with him out in the yard. He is a ball dog and loved chasing and returning the tennis ball to Emelynn. He had to be encouraged to drop it, but eventually would, in order to get another ball thrown. 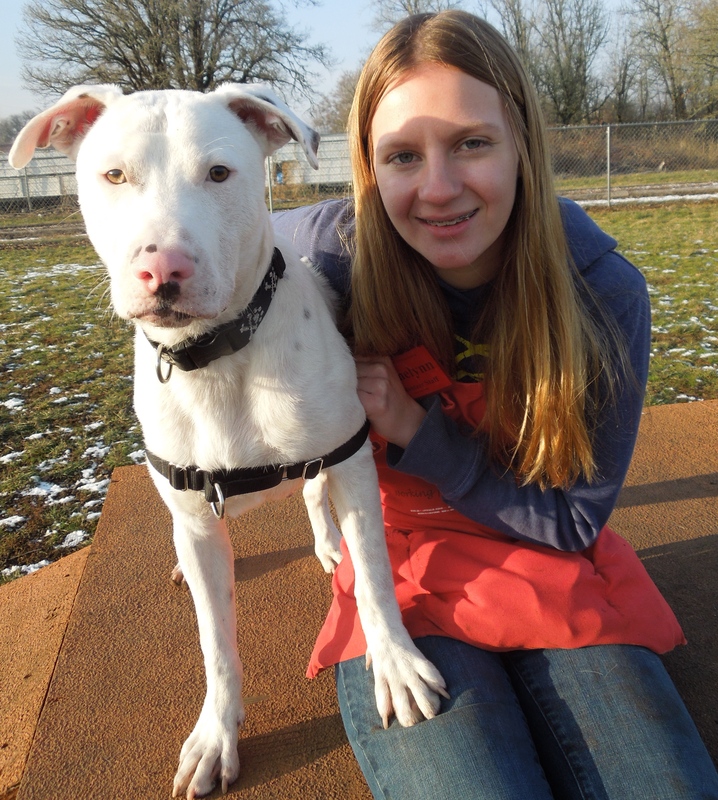 Dallas has had some house-training issues which he will need to continue to work on in a new home. He is an active, very smart boy who deserves someone who will help him become the wonderful dog that he has the potential of being! There are three wonderful updates today! 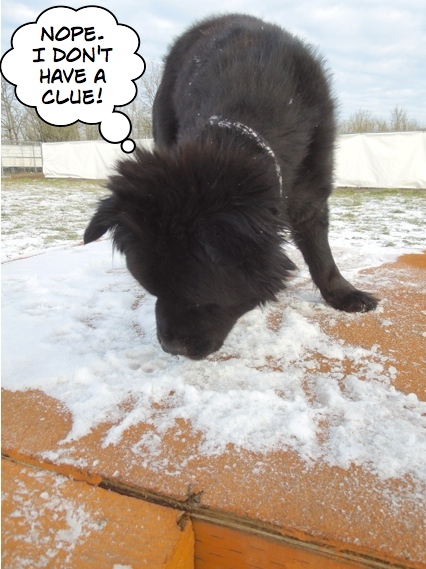 Also, Heather reports that Mary loved the recent snow! 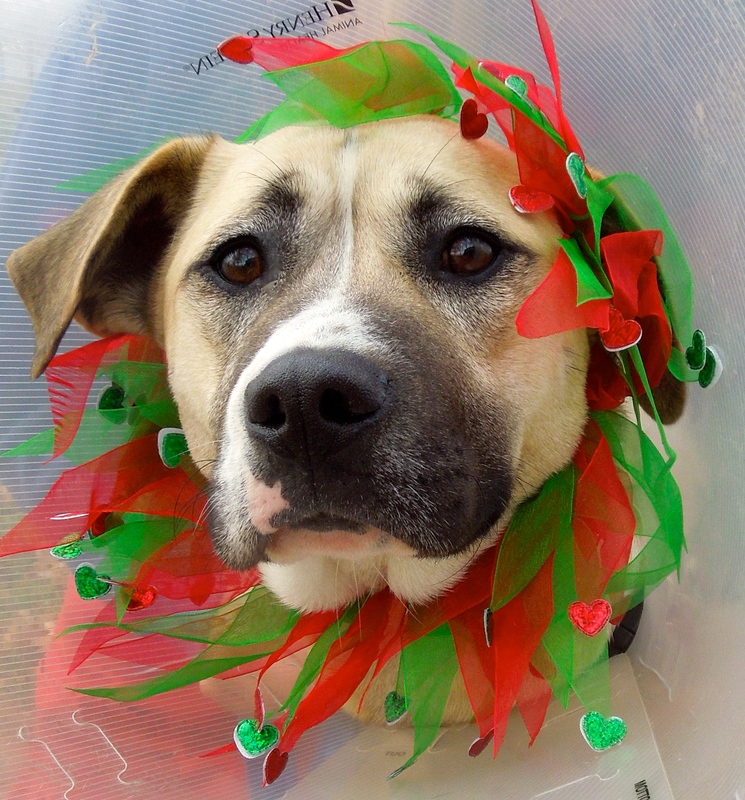 Remember Jasmine, the sad Shepherd mix who was so stressed in the shelter environment? One of my blog readers saw her and fell in love. Here she was in the shelter with such sad eyes. Here is the update on this wonderful adoption! 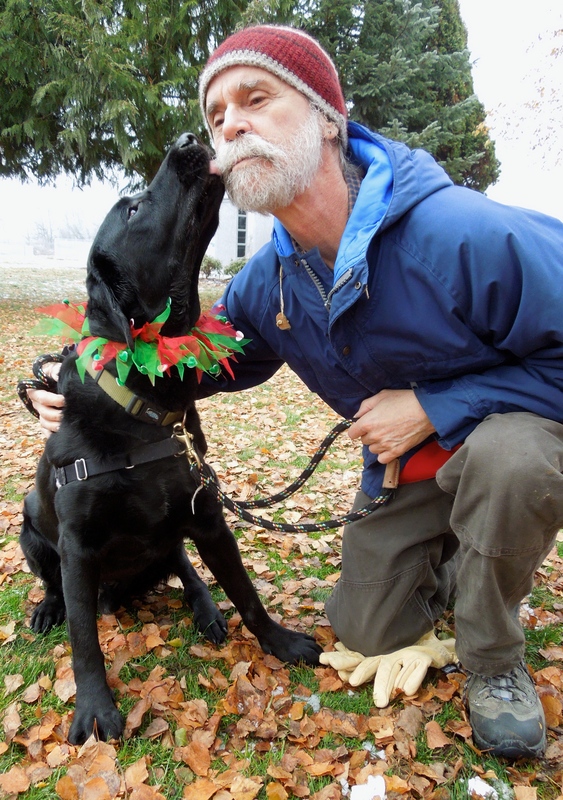 Many of you will remember Gilbert’s story. 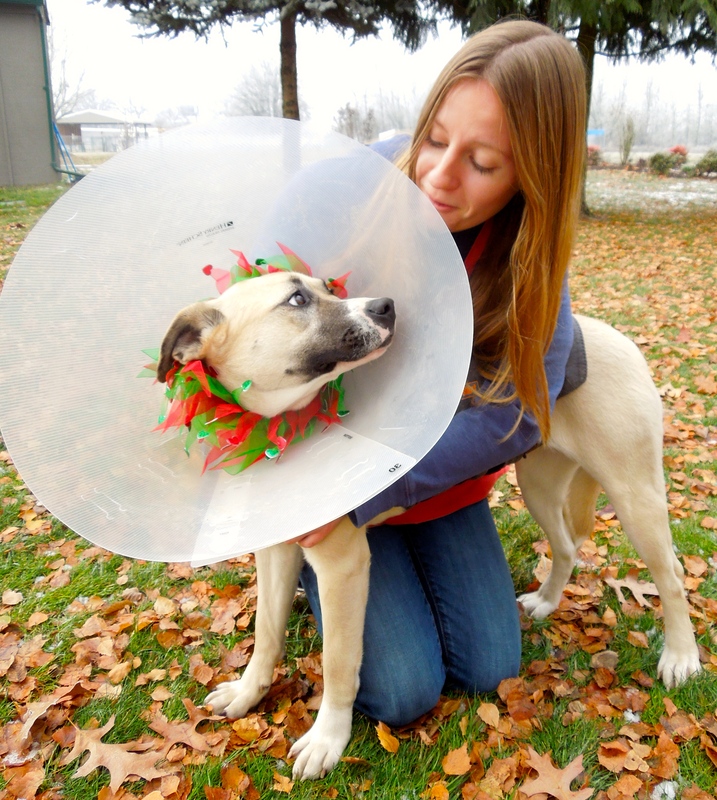 He had been volunteer Jolene’s foster for many months when he was finally adopted. Well, the family had to return Gilbert and guess who decided that she had missed him far more than she realized she would? Yep! 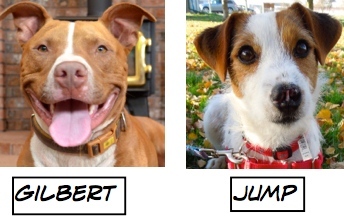 Jolene adopted Gilbert. I was so thrilled to hear the news! To Gilbert, of course, he’s just home again. Wonderful happy ending stories again. 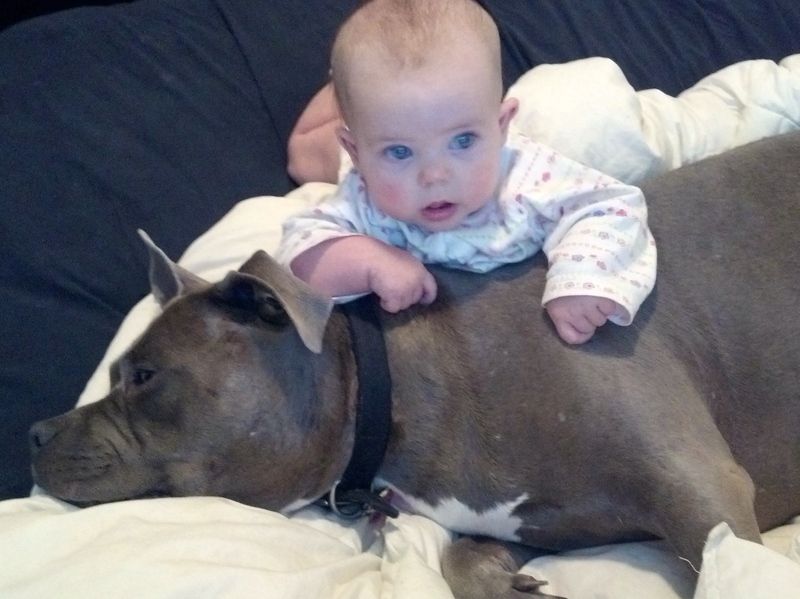 The pictures of Mary were so fantastic I had to share one further- hope it is ok. People need to know how sweet those pit bulls can be; they don’t know they can be such great kids dogs. The owner got a great picture of the baby; what a cute face and expression- it glows! Sigh… I’ve fallen in love again and again and again! 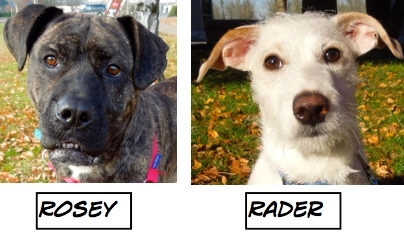 Martha, thank you once again for the fantastic pictures of these beautiful furbabies. 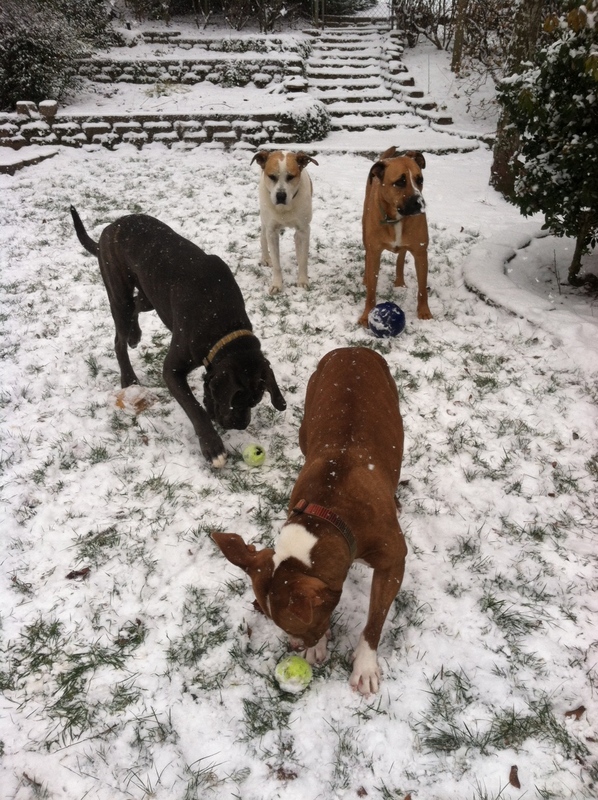 Looks like they had a good time in spite of the snow and cold weather. Glad adoptions are still going strong! Great edition – again! I’m so happy to hear the wonderful update on Jasmine/Mazzy. She was so sad at the shelter, it broke my heart. 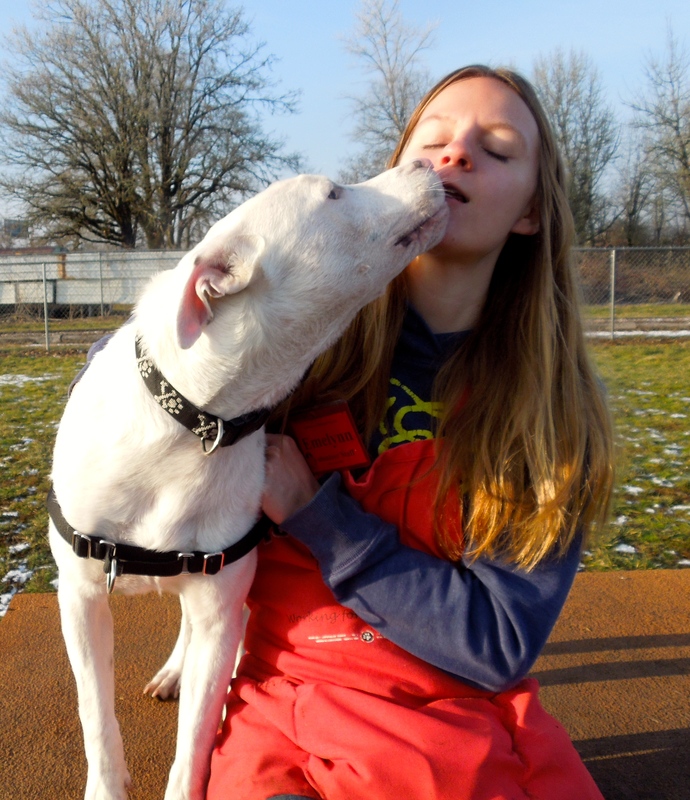 But it’s obvious she’s found a wonderful home with a wonderful person to love!!! Seeing Mary so happy and content just reminds me that sometimes when we feel so broken hearted each week when we see a dog is still there, there just might be something bigger at work. Her journey just makes me so incredibly happy and it brings a smile to my face every time we see a new picture. Just reminds me to have hope for some of our long term residents. Felicia and I always get a great laugh when we read the balloon sayings over the dogs. Keep up the great blog. 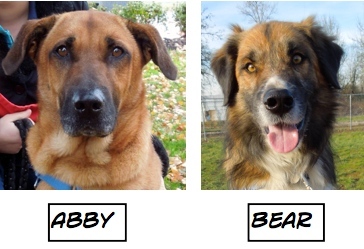 I just wanted to say that my family is the one who adopted Bear. He has been a wonderful addition to the family. He loves his car rides and getting lots of attention. I am so glad we got him. Tanya! Thanks so much for writing! 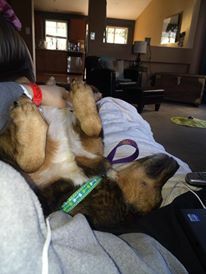 Could you send me an update with a couple of pictures of Bear in his new home? 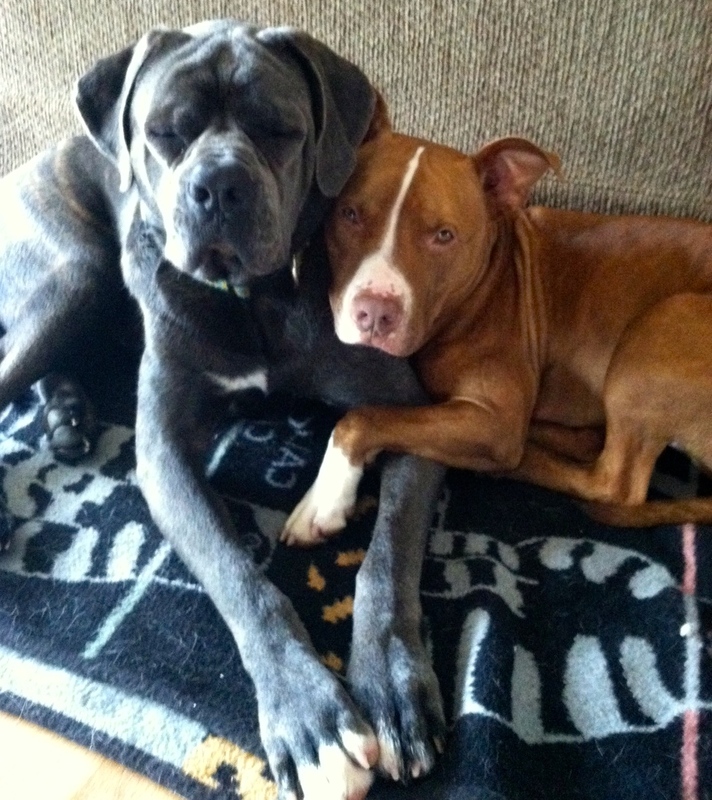 Send it to me at adoptanoregondog14@yahoo.com. I’d love to have an update for my readers! 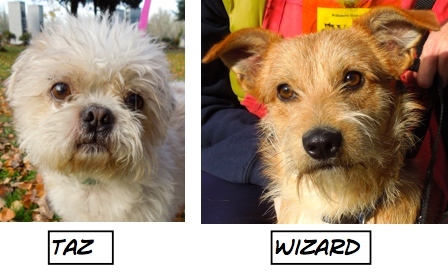 We wanted to wait first and make sure “Wizzard” (Now JP) was a good fit for our family and we love and adore him so much!!! He is just that perfect piece of the puzzle that was missing from our family!! He is super smart and so full of this quirky amazing personality. We can not image our life without him!! !